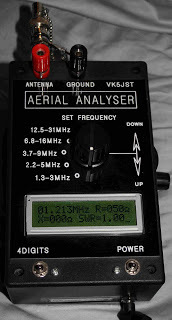 Believe it or not, this VK5JST aerial analyzer kit is going to rickroll you. [Erich] wanted to see if he could use the device in a different way. His adventure led him to use it to feed different tones to an AM radio, producing the all too familiar [Rick Astley] offering. There’s a fair bit of math that goes into getting the correct signals to generate a given pitch. But it basically boils down to patching into the hardware early in the RF generation. This way an audio signal can be rolled into the carrier frequency. Since this kit uses a PicAXE microcontroller with available source code it is rather easy to add audio input to tweak what the chip is putting out. But there is also some hardware tinkering to be done. Read more about that at the article linked above, and don’t forget to check out the bottom of that page to hear the final results. ← DARPA funded Robot Ninja Warrior? The technical term for this “rolling” is “Amplitude Modulation” and it involves varying the amplitude of the RF with the audio signal. Usually done with either a variable attenuator or varying the gain of an amplifier. If he has extras and just doesn’t have a use for them I would be happy to give one a nice new home and a job analyzing antennas! Analyser functionality remains fully intact, since one of the toggle switches was commandeered for detecting when the user wanted to go to and from rickrolling mode, and all of the SWR calculations and detection network remains untouched. Also, a shielded cable was used from the 680 ohm resistor to mimimise stray RF effects on the normally rock solid AGC action, but I have not tested the oscillator stability at higher frequencies with my mod in place – which can be easily removed anyway. The beauty of the analyser is that it is easily reprogammed and modified…. and the morse practice and beacon functionality could still be added without affecting the analyser’s core functionality. All in all, I’m very happy with this well designed and eminently flexible bit of test gear! !